It was beginning to drizzle when we arrived in Hanoi. We planned to stay with our first CouchSurfing host in Asia. The cabbies rubbed us the wrong way (cab drivers are usually the most aggressive breed of human), so trekked what we thought to be the 5km (but ended up being 8km) through the rain to our host’s house. There were few people walking and stray dogs were markedly absent. The mosaic wall that runs alongside the main north/south road was a nice distraction from the persistent drizzle. New Friends & 20 Cent Beers! The addresses in Hanoi are incredibly confusing. Despite asking 4 different locals on what we thought was the correct street, we remained dumbfounded. A few nice locals let us use their phones before we agreed to meet Travis at a nearby café. 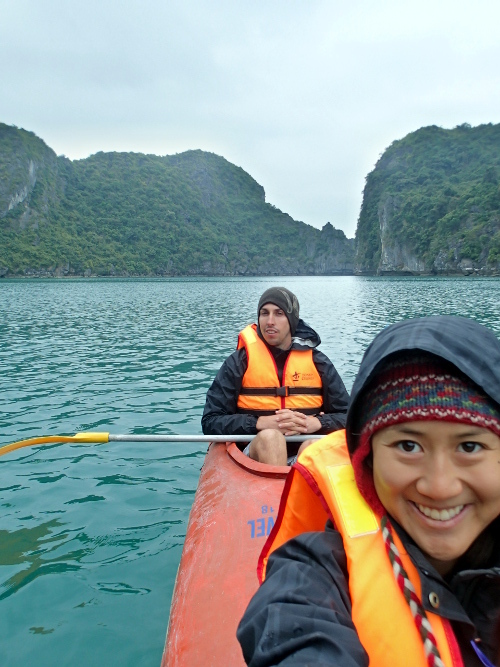 Travis and his girlfriend, Zuzana, had recently moved to Hanoi from southern China. They started a bike trip, intending to reach Thailand, but fell in love and decided to start anew in Hanoi. They were both incredibly welcoming hosts and it was so interesting to hear about their time in Poland, Ukraine, China and now Vietnam. Travis had lived in California and Texas (within 10 miles of where Matt grew up – small world! ), so we were excited for another opportunity to make tortillas for tacos. Happy Tet (Vietnamese New Year)! 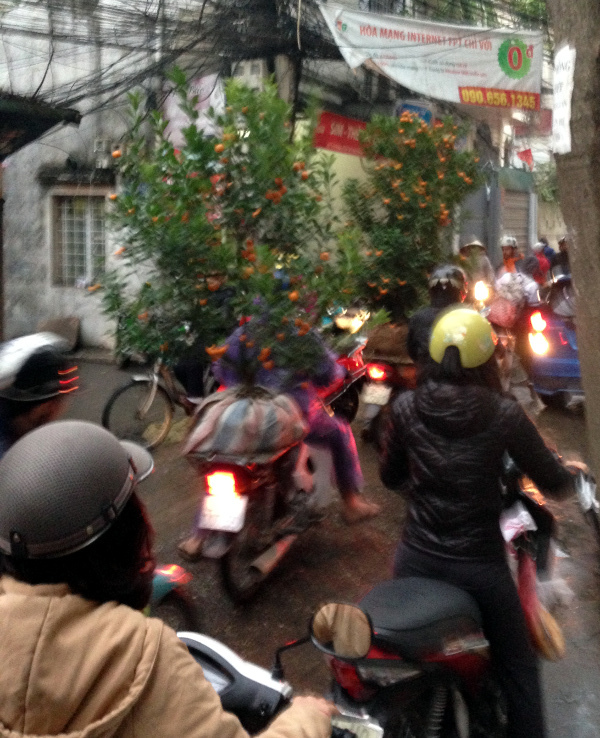 And yes those are mandarin trees riding around on the back of motorbikes for good luck. The next day, we all went into the Old Quarter, where Travis gave us a brief walking tour. Most importantly, he introduced us to bia hơi, 20 cent draft beers. Bia hơi can be found on the street while seated in the tiniest stools imaginable. When your glass is empty, just yell “BIA Hơi!” and you will be given another. The Vietnamese may be some of the hardest working people we’ve encountered – the shop across the street from Travis was still open when we returned around midnight and open when Matt and I left at 5:30AM the next day. 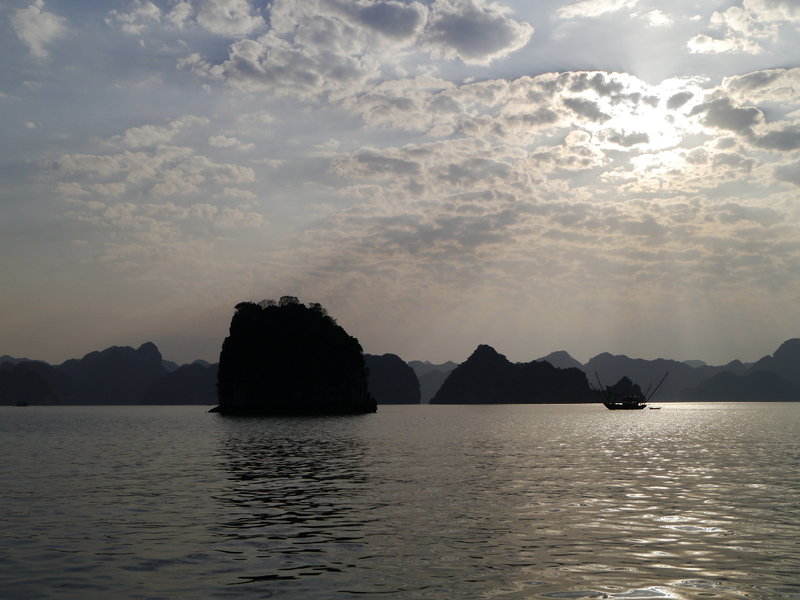 If we had more time in Vietnam, I would probably have forgone taking a cruise and explored Halong Bay by staying on Cat Ba Island. 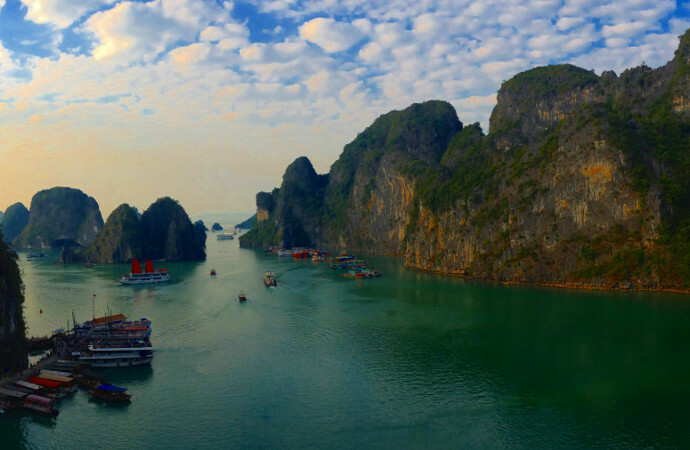 But a nice treat every once in a while is deserved – we took a luxurious (for us) cruise along Halong Bay on the Marguerite Garden. Mr. T, the ships general manager, greeted us at the port with a huge grin, cracking jokes. There were only around 10 cabins on board, a good size for getting to know the other passengers. We shared the boat with a few other couples our age but also older clients (a sure sign that this was more lux than we typically book). First impressions – the karsts were so magnificent and different than anything I’d seen before, I almost forgot that we were in the ocean. We settled into our cabin and enjoyed what must have been the most food we’d eaten in Asia to date. On a transfer boat en route to Surprising Cave, we watched a big boat head straight towards a female kayaker. A deer in headlights, she froze and stopped paddling. Fortunately bailed out of her kayak seconds before the big boat ran straight through the kayak, breaking it in half, bobbing as if it were a final plea for help before sinking down. The group of us just stared in disbelief – our boat crew ensured that she was picked up before continuing. Fortuitously, someone in our group had taken a photo a second before it happened, capturing the boat number which was later given to the authorities. After Surprising Cave (named such, as it is surprisingly large inside), we hiked to the top of a hill to watch sunset. We lucked out on the weather – 3 days before we arrived, all cruises were cancelled for weather, and as it turned out, the second night of our stay would be cloudy. The boat is parked for the night in a bay with all the other tourist cruises – we lucked again that out that our room faced the magnificent karsts instead of the other boats, yielding a vista of a perfect, starry night. 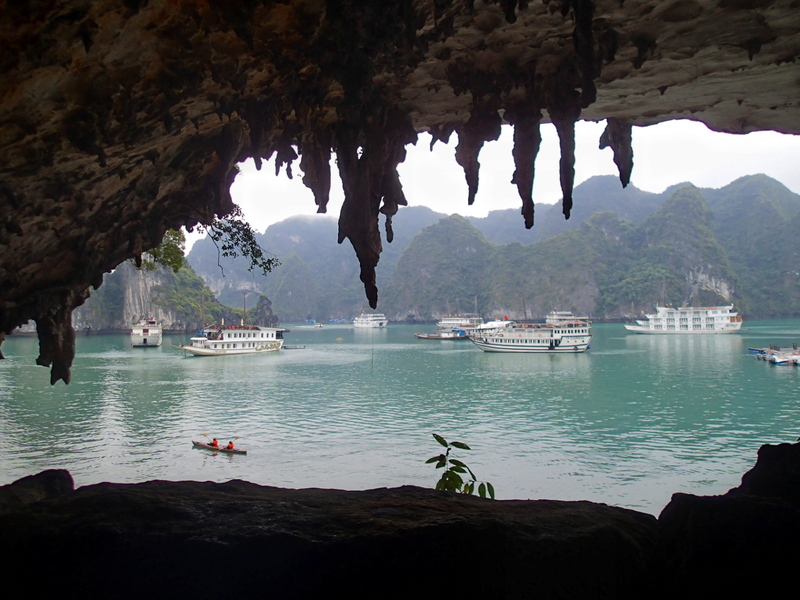 The second day, guests who only booked one night would do a short excursion before heading back to Hanoi after lunch. We had another boat pick us up for an all-day excursion that would take us further to the bay. There was a huge boat just for us and two guys who met during their travels in Vietnam. The plan was the kayak for a couple hours around sea caves, head further offshore to the beach before going to a pearl farm. A pearl farm didn’t interest me at all, but I was really excited for the other activities. We were the first ones in the water near the sea caves. 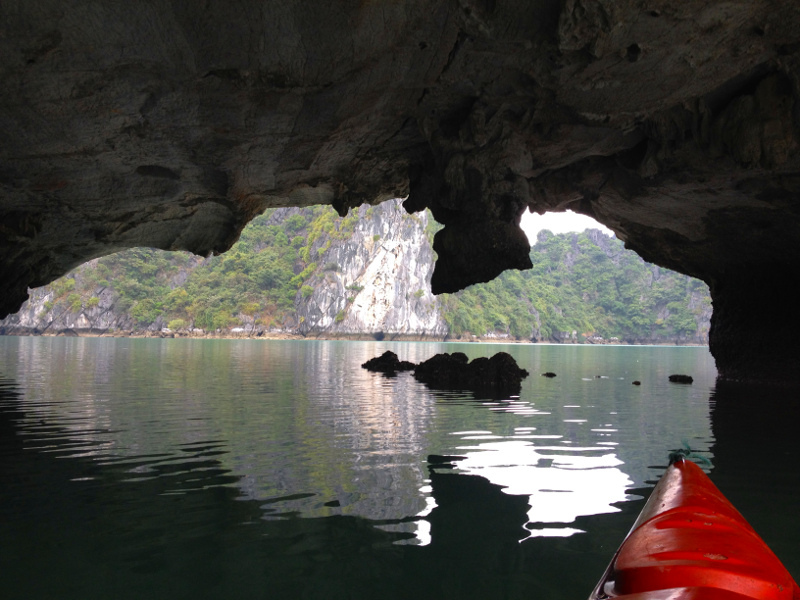 The four of us paddled around leisurely, enjoying the caves and the silence, only periodically broken by the gentle pull of our oars. We saw monkeys playing in the trees and watched the little fish dart back and forth. Even though this area has been seen many times by the masses, I couldn’t help but wonder what it must have been like to be one of the first people to discover this area. Despite the number of times we picked B, Mr. Nam kept insisting that the sea sickness would be horrible, and at the end he concluded that the seas were too dangerous to drive through. We acquiesced and ended up at the pearl farm, only a 10-minute drive back to home base. What were we going to do for 4.5 hours? None of us were interested in pearls, we had already been kayaking, and the water was definitely too cold to swim. As we sat around at lunch, we realized that we’d be had. Icing on the cake was when Mr. Nam came back in and said that if we wanted to, we could always head back to the boat early as we “must be so tired from a long morning.” We decided to stage a mutiny. Annoyed at myself that it had taken me too long to be more firm, I told Mr. Nam that I didn’t want to kayak, swim or go to the oyster farm. That there must be another alternative. Mr. Nam was like “Oh yes, you must be so tired from all the kayaking, yes the water is really, really cold this time of year.” He even tried to turn us against one another and asked the other travelers, “Don’t you want to see the oysters?” I was incredulous at this point but tried my best to continue being pleasant and complimentary. Matt took over the bad cop role while Greg came to the rescue with his printed itinerary of the schedule (which actually showed that most boats head to the beach post-lunch). 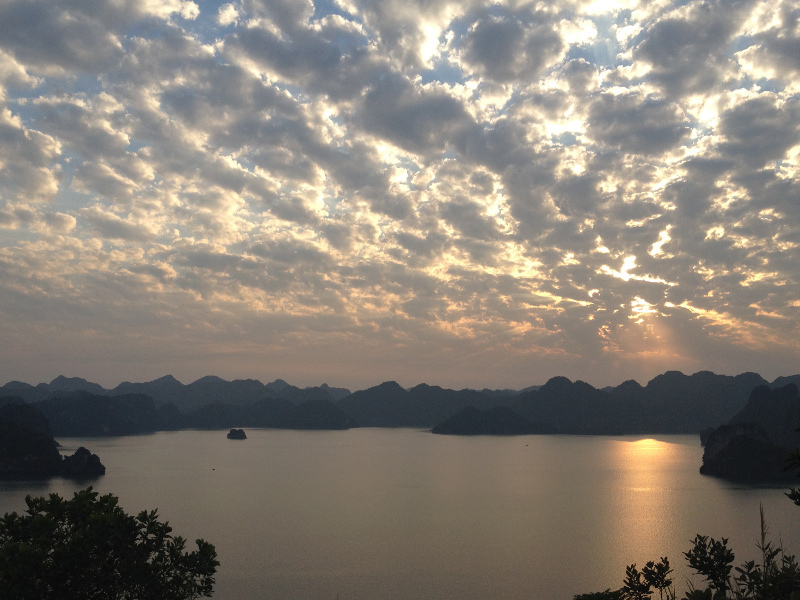 Each turn along Halong Bay offers a new view; we just wanted a chance to see more. Finally, the other company’s tour guide also came down and agreed to take us to his favorite cave, Fairy Cave. 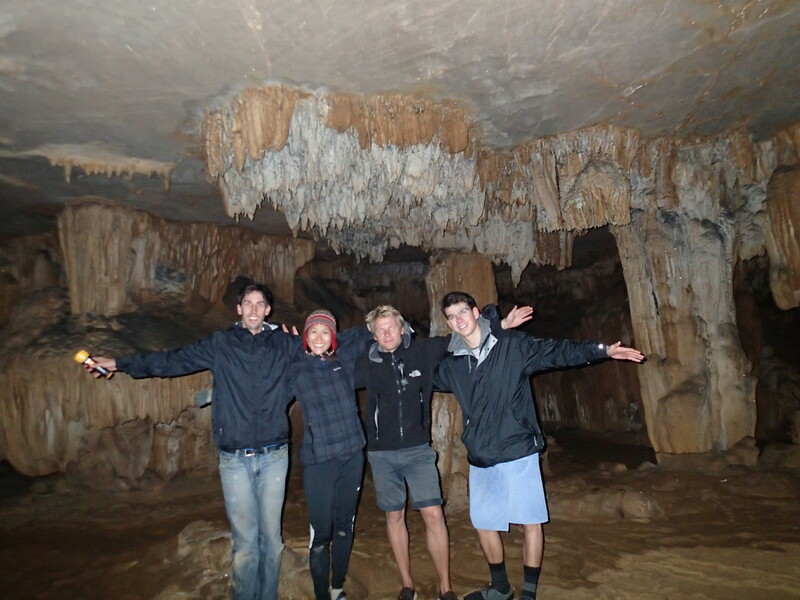 Each carrying a flashlight, we crouched through narrow passageways to get to some of the cave’s distinct rooms. The guide glided through the cave with familiarity as he tapped the stalactites and stalagmites; the resulting sound was like a mystical xylophone. We entered a room for which the cave is named and turned off the lights to reveal what looks like gold glitter. The small lagoon within the karst added to the mystical ambiance of the island. Life on the boat was easy. Get back on board, eat delicious food and relax. The next morning, we went on a short kayak excursion with Mr. T. The kayaking was mediocre, but we really enjoyed Mr. T’s commentary and insight. That evening, we were back in Hanoi for more bia hơis with Travis and Zuzanna. One night, we stopped by a CouchSurfing Hanoi event to speak to some others within the community. Turns out, it is advertised to the locals as an English practice session. The other night, we went out with two students who were volunteering at Travis’s English academy. Fun times all around! We originally planned to take the bus from Hanoi to Vientiane, but decided to take the easy way out and take a 1 hour flight vs. 30(+?) hour bus ride. I will miss the nice people we met here and the food. It was an impossible task to eat enough che, pho, banh mi, bun thit neung, and spring rolls to fulfill my Vietnamese food craving. 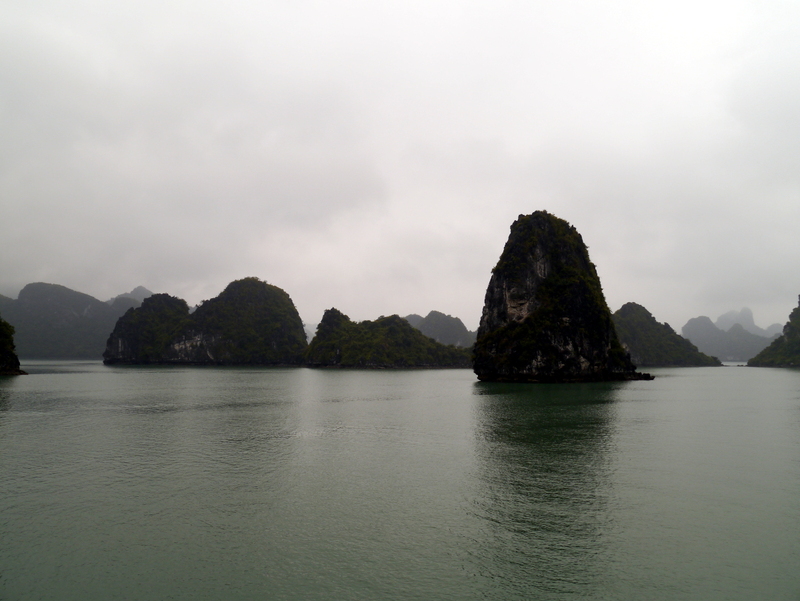 Goodbye, Vietnam! search results. You should reduce your bounce rate in order to rank in google.